Okay, after more than a month since my last laundry break, I needed a zero day to de-scuzz my wardrobe. I chose today because the weather had turned hot, sultry, and humid with an increasing threat of showers and storms and heavy rain, anytime after 11AM. It actually sprinkled some between sunrise and 7AM too, so I figured I had 'chosen wisely'. Now ... I had checked out the *Scum Pit* laundromat in Gorham. Sorry folks, it's actually called the Laundry Basket, and it's really conveniently hiker-located right next door to the post office. But 70% of the machines were out of order. And the vibes were pure 'scum-pit'. On my scouting visit I couldn't get out of that place quick enough. It's like some of the laundromats I remember from college days where your laundry comes out dirtier than it went in because of the toxic waste residue that previous users were trying to wash off their clothes. People go into laundromats like this in order to wash things they wouldn't allow in their home washing machines. But being blessed with a vehicle, and a whole free day to use it, I had the luxury of many more options. I chose to drive 120 miles back to West Lebanon, NH to a laundromat that had caught my eye. It's run by Kleen, Inc., a 100-year-old local family business that also does hospital laundry in their central plant. This laundromat and dry-cleaning outlet is open 24 hours. There was a friendly, cheerful and very helpful attendant, and dozens of machines of all varieties, with only a few out of service. The place was bright and clean and fresh (the attendant mopped the floors while I was doing my laundry), and is virtually right next to the I-89 West Lebanon exit in the K-Mart shopping center. Through all my life experience, this is by far the most immaculate, welcoming, non-sleazy laundromat I've ever experienced. I got my laundry done early then did some shopping, restocking favorite trail foods, some of which are not easy to find. 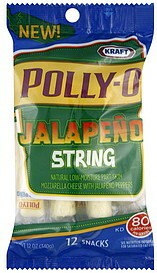 Most particularly, the Jalapeño string cheese sticks that are my anchor and staple on the trail. Only a minority of full-sized grocery stores carry these. Everybody and his uncle carries the regular Mozzarella string cheese sticks; but to me they are bland by comparison. The Jalapeño-flavored ones are much harder to find, and much more savory. It's not just the (mild) 'heat', but the flavor. String cheese sticks need to be refrigerated, but they last 24 hours easily without it. They're classic kids' school lunch-box food, and the Jalapeño version is good enough that I'm willing to drive 120 miles out of my way to stock up on, especially with the great laundromat across the street. I bought 20 packages. These perfectly complement my other trail staples: Flavor-Blasted Goldfish (a custom mix of one quarter Pizza flavor and three-quarters Extra Cheddar flavor that I blend as needed) and good old original Oreo cookies ("Milk's favorite cookie"), bought in family packs. Milk is my 'at-home' cooler staple - have a half liter of it for breakfast and again as soon as my hiking day ends every day. On the trail, to avoid 'hitting the wall', I have a 'feed' every 2 to 2.5 miles of hiking (depending on trail difficulty), which consists of one Jalapeño cheese stick, one full mouthful of flavor-blasted Goldfish crackers, and two to four original-recipe Oreo cookies. I could live on this diet for the rest of my life :-) Although both Goldfish Crackers and Oreos contain a surprisingly generous helping of fiber, I also carry and consume five Sunsweet prunes a day - my morning 'constitutional' - three on the first feed, two on the second. I love the flavor of prunes and they keep the cheese from clogging up the old tubes. So today was a classic Zero Day. I got the town chores done, restocked, and was ready to head back to the trail. Only difference - the town was 120 miles from the trail. Oreos have fiber?? Who knew?? Dude, I hope you plan on detoxing when you finish your hike. LOL I'm on a diet and I'm DROOLING as I read your foodie paragraphs. :D I'm happy that you find some minor comforts while on trail. Food is a BIG 'UN!